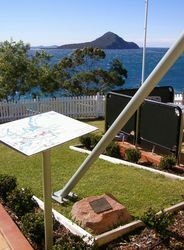 A plaque commemorates the crew of Catalina Flying Boat A24-39 which crash landed near Port Stephens with the loss of 7 lives in 1943. Catalina, A24-39 (USN 0826), of 3 Operational Training Unit Rathmines (3 OTU) crashed during a landing in rough seas opposite Wonderrabah Knob, Port Stephens, New South Wales on 24 May 1943. The aircraft had been delivered to the Royal Australian Air Force in February 1942.